Chennai Express is all about the journey of Rahul (Shahrukh Khan) from Mumbai to Rameswaram and elaborates about how he meets Meena (Deepika Padukone) on the way, which changes his life forever! 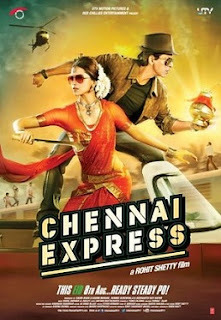 Shahrukh Khan is at his funny-best. He doesn’t try to be a hero. He comes across as any of us and reacts in the way how any of us would react in such situations. There is nothing Godly abiout him and his humane charaterisation makes us fall in love with him – Love him with all the short comings. Deepika as local don (Satyaraj) daughter is bold and looks pleasing. But she looks more like a North Indian spoofing a South Indian. Her brown hair looks out of place and half-saris are more like a designer wear. But there are no flaws in her acting. I wish that Deepika worked a little more on perfecting her Tamil accent. It would have made it more believable. Still I wish that it was enacted by a South Indian... May be Trisha... I bet that she would have looked best! There are many Tamil serial artists in supporting roles. Then there is Satyaraj. Music is ok-ok kind. I loved Tithli song. And Lungi Dance is just awesome. The climax fight scene could have edited. It is too tedious. And I loved the poignant point that Rahul puts across in the climax. And, u will enjoy the movie if you belong to (m)any of the following categories. And I enjoyed immensely because I fall under each of the following categories! ® Associate each situation in your life with one movie or the other! ® A compulsive fan of superstar – Rajnikanth! But all said I still love DDLJ... K2H2... K3G... Swades... Dil Se... Chak De... I still don’t prefer OSO... Jab Tak Hai Jaan... Ra One... He is an intense actor. His eyes speak volumes and silence conveys so much. I believe that Salman Khan and Akshay Kumar are there to do that! Shahrukh... Waiting for a magic!! !